Though Emily Stecher and Stephen Rosenthal were on the same intramural soccer team in college, they didn’t officially meet on the field. It all started after a night out with friends when they decided to share a cab ride home. “She ‘accidentally’ left her phone sitting next to me. Debates still rage on about the intentionality of the ‘forgotten’ cell phone. She claims it was an innocent mistake, but I know an excuse to see me when I see one,” quips Stephen. Whatever the intent, “from that point on it’s history!” says Emily of their romance. The couple had been living together a few months, when Stephen was struck with how happy he was and thought, “What am I waiting for? !” Not feeling well-versed in the jewelry shopping department, Stephen turned to Emily’s mother for assistance in selecting an engagement ring. “Her mom and I went to their family jeweler and the three of us put our heads together and came up with a design!” he says. A mere week later – much earlier than anticipated – Stephen received a call from the jeweler notifying him that the ring was ready and he rushed to pick it up. 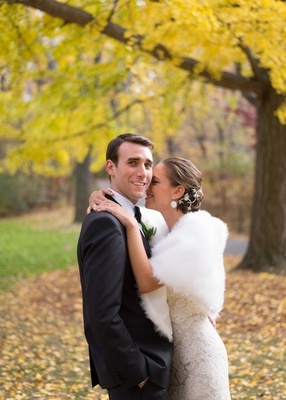 “About three seconds after I had it, I decided [to] propose that night,” he recalls. Stephen decorated their apartment with roses and dozens of candles and surprised Emily when she returned home from work. In addition to a wedding planner who helped make matters manageable, “my family, specifically my mother, was very involved,” says Emily. 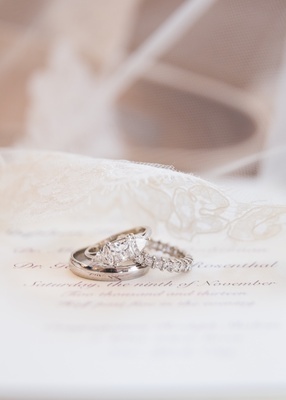 “She held my hand throughout the process and it was a great experience for us to share.” As for the groom’s involvement? “I had a heavy hand in deciding the font for our save-the-dates – clearly, Garamond – but other than that I didn’t have many strong opinions,” jokes Stephen. 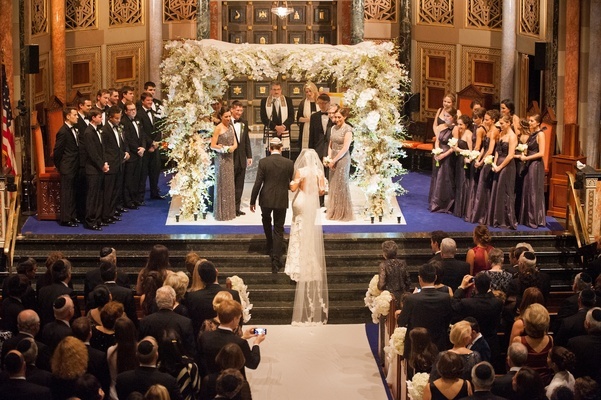 Choosing to have their ceremony in the synagogue Emily attended growing up was another simple decision. 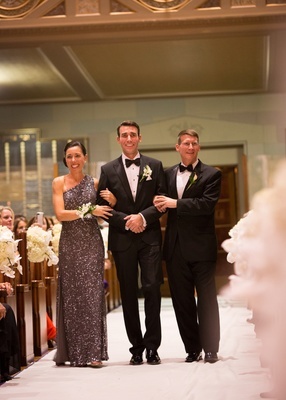 Emily and Stephen opted for a classic mix of whites and ivories to complement the ornate interior of the sanctuary. 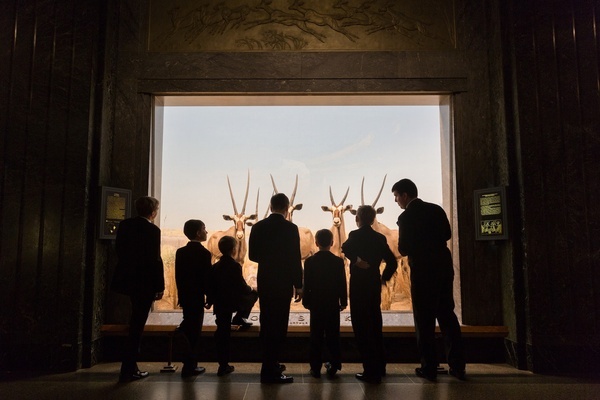 Tying into the spirit of the reception venue – the American Museum of Natural History – the theme from Jurassic Park played for the bridal processional, which include 12 groomsmen escorting bridesmaids in full length plum-hued dresses with differing necklines and holding posies of cream calla lilies and tulips. 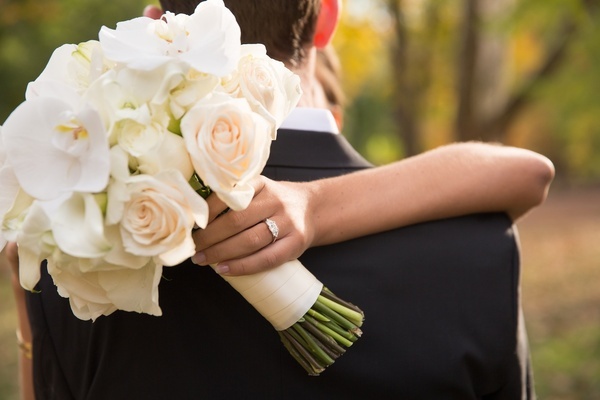 With her parents by her side, the blissful bride walked down the aisle in a white fit-and-flare lace gown to the tune of Taylor Swift’s “Love Story.” She carried a bouquet of vanilla roses, orchids, and calla lilies wrapped in fabric. 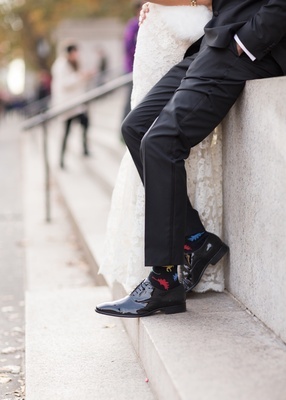 Like his groomsmen, Stephen donned a black tuxedo and whimsical ebony socks covered in colorful dinosaurs. 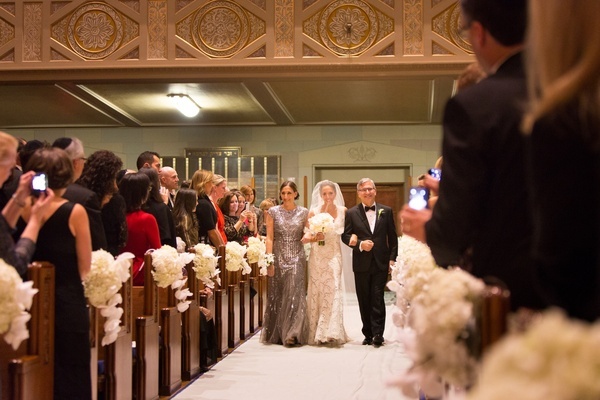 The ceremony was officiated by the rabbi who performed Emily’s bat mitzvah and Stephen’s conversion. “It was important to get married in such a special place and by a man who means so much to us both,” says Emily. 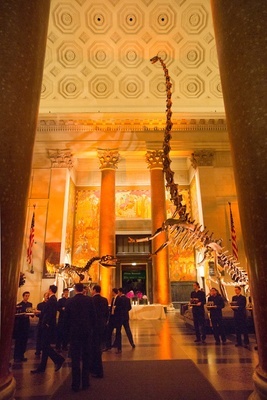 For the reception, the couple focused on the qualities of the museum they loved most, starting with the cocktail hour, where guests mingled amidst its iconic Barosaurus and Allosaurus installation. Golden light accentuated the space’s magnificent Corinthian marble columns and murals. 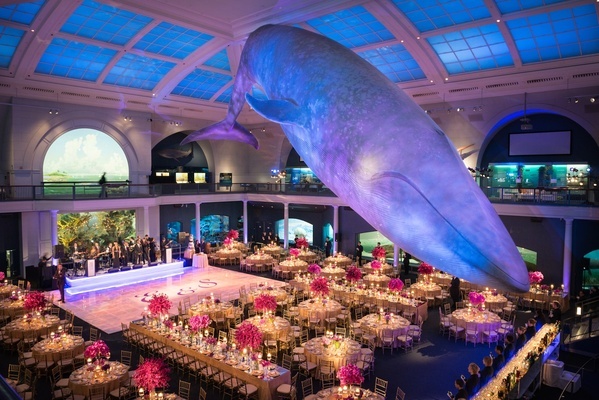 A few steps away, a myriad of aquariums and a suspended life-size blue whale delighted guests. Long, rectangular tables and round tables were laid out around the dance floor, as well as an illuminated raised stage for the band. 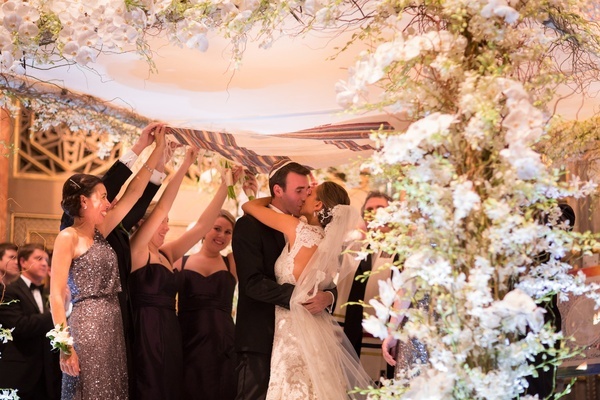 “Since we met at Northwestern University, purple – the school’s color – was immediately what we envisioned with our florals and reception décor,” explains Emily. “We mixed in royal gold accents to provide a warm counterpoint to the cool tones.” Thus, golden accordion taffeta linens were selected as the perfect platform for the vibrant blooms. 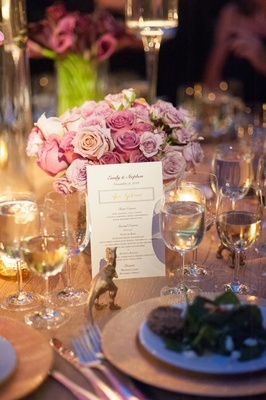 Three different centerpiece designs adorned the round tables. 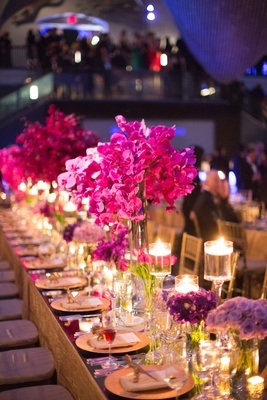 Two of them were anchored by bursts of either fuchsia dendrobium or phalaenopsis orchids in tall glass vases surrounded by a trio of smaller, single-variety arrangements of tulips, roses, and calla lilies; or roses, lisianthus, and stock in varying violet shades. 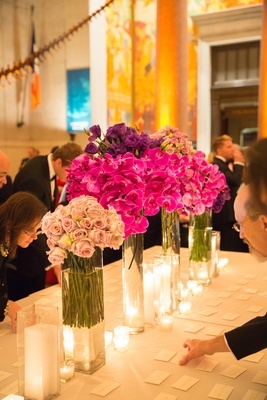 The last was comprised of three low floral arrangements of dendrobium orchids, calla lilies, and garden roses in amethyst hues. 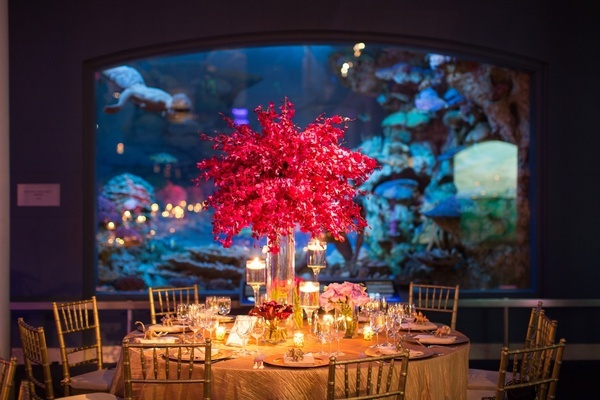 The rectangular tables featured mirror tops and showcased the same floral styles as the round tables lined along their centers. Floating candles in Monet glass vases along with votive candles highlighted all tablescapes. 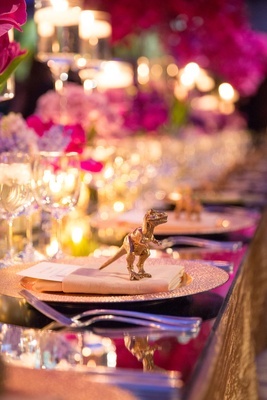 As a finishing touch, a gold dinosaur wedding favor stood atop each place setting. 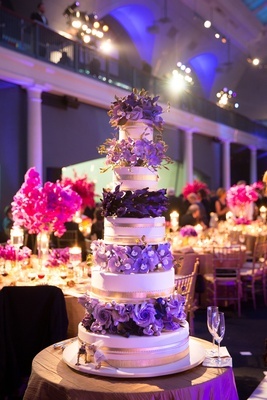 Reflecting the color scheme, a variety of incredibly intricate and lifelike flowers in different shades of purple were tucked in between the cake's five white tiers, decorated with alternating single and double golden bands. 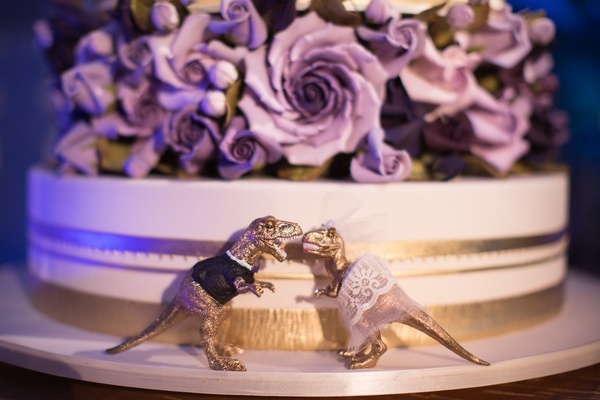 Two gilded dinosaur figurines, one dressed in lace and the other in a black coat, stood in as the toppers in front of the cake. “To keep our guests dancing, we cut the cake into small, square pieces so that they could be passed around the dance floor,” says Emily. 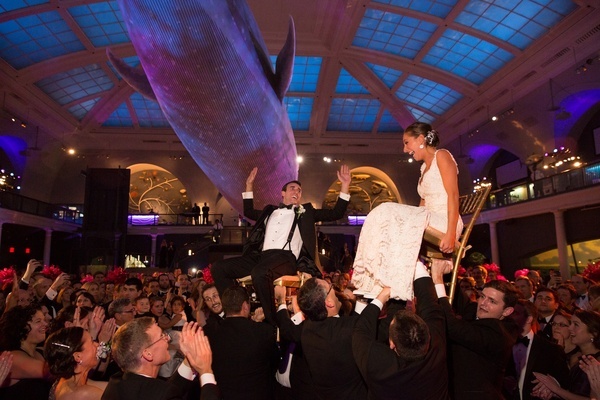 A particularly memorable moment for the newlyweds was their first dance. 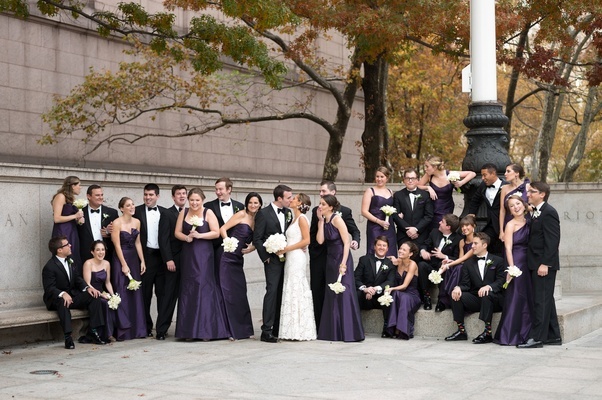 The groom recalls “being so nervous – and then crushing it.” Their entertainment choice certainly had an infectious effect. “From the second we walked into the room, the entire place was dancing – people stopped to eat, but bounced right back out there in between courses,” says Stephen. “It was absolute perfection.” Closing the celebration on a high note, during the last song “we were dancing on stage with the band who were seriously all rock stars!” says Emily.